This skills program takes a look at the latest in safety advice in grizzly bear country. What if the safest way to protect yourself from a grizzly bear was also safer for the bear? 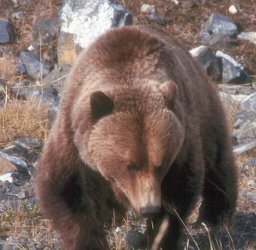 Steve talks to Chris Servheen, the Grizzly Bear Recovery Coordinator for the U.S. Fish and Wildlife Service. Chris authored several fact sheets on bears, including the most recent, Bear Spray vs. Bullets—which offers better protection? Chris refers Steve to a scientist who's doing the leading-edge studies on how to most safely handle yourself in grizzly bear habitat. Tom Smith, an Associate Professor of Plant and Wildlife Sciences at Brigham Young University, has studied the entire documented history of bear encounters in North America for the past 120 years. Tom explains why certain deterrents work better than others. WildeBeat Members can download our entire 40-minute interview with bear researcher Tom Smith from our WildeBeat Insider web pages.